Suriya starrer Lingusamy directorial Anjaan is gearing up for a 2014 Independence Day release. The film stars Samantha as the heroine and Yuvan Shankar Raja’s music has been well received by the audience. Meanwhile Suriya has begun his next film to be directed by Venkat Prabhu titled 'Masss'. The film started on an auspicious note with a 'poojai' recently. The shoot of the film as reported earlier will begin in Chennai next week. There are plans for some scenes and songs to be shot abroad but the locales are yet to be confirmed. 'Masss' will have Nayanthara, Amy Jackson, Parthiban as Suriya's co-stars with Yuvan Shankar Raja, editor Praveen and cinematographer R D Rajasekar as part of the technical department. Yuvan misses the National Award by a whisker ! Ajith's 'rough and tough' 2nd look for 'Thala 55'? Shruti Haasan leads Dhanush and Rajini ! How Did The 25th Films Of Ajith, Vijay And Suriya Turn Out? 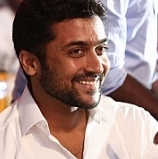 Will Suriya Be A Part Of Pandiraj's New Film ? People looking for online information on Amy Jacksom, Amy Jackson, Masss, Nayanthara, Suriya, Venkat Prabhu will find this news story useful.